Kinshasa (Agenzia Fides) - The date of the presidential elections in the Democratic Republic of Congo, scheduled for December 23rd, is approaching, and national and international initiatives are multiplying to ensure that the vote takes place regularly. 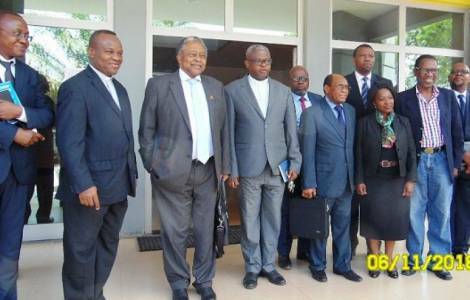 Among the partners contacted: the Congolese National Episcopal Conference (CENCO), which in 2016 had the role to mediate between the parties in order to find a way out of the political and institutional crisis followed by the postponement of the presidential elections, which should have been held within the deadline of the second term of President Joseph Kabila, December 20, 2016. Thanks to the mediation of the Bishops, on December 31, 2016 an agreement was reached to bring the country to the elections after a transition phase. The agreement, known as the New Year's Eve Agreement, was only partially applied, but at least led to the date of the vote for December 23 this year. The role played by CENCO to reach the New Year's Eve Agreement was recognized by Leshele Abel Thoahiane, head of the delegation of the SADC Electoral Consultative Council (Southern African Development Community), which met on 6 November in Kinshasa with the General Secretariat of CENCO, Don Donatien Nshole. "We encourage CENCO to follow the pending issues because we want to be sure that the elections in the DRC are credible". Among the points still under discussion is the use of electronic election machines.